The PerfectSight team ranks first among Jedox partners, distributors and integrators. PerfectSight is the only center of excellence in France whose talents possess a combination of technical and functional expertise backed by longstanding and proven experience in the areas of Finance and Management Control. We are authorized to sell Jedox software licenses and provide support in the use of their software systems. Every PerfectSight consultant is certified in Jedox technologies. Jedox is a comprehensive integrated Business Intelligence platform used to create analysis, planning and reporting applications within a convivial, familiar and easy-to-use environment. Jedox is the only Business Intelligence (BI) and Performance Management (PM) solution that operates on a single technical environment. across all departments; Management, Finance, Management Control, Sales, Marketing, Production & Manufacturing, Procurement, HR, IT, Governance & ERM, etc. The Jedox solution is recognized for being easy to deploy, its high performance, an ability to process large volumes of data and above all for being resolutely end user-oriented. Jedox provides the benefit of the highest level of productivity and the finest rate of satisfaction and recommendation (at project completion) available on the market (2012 BARC BI Survey). 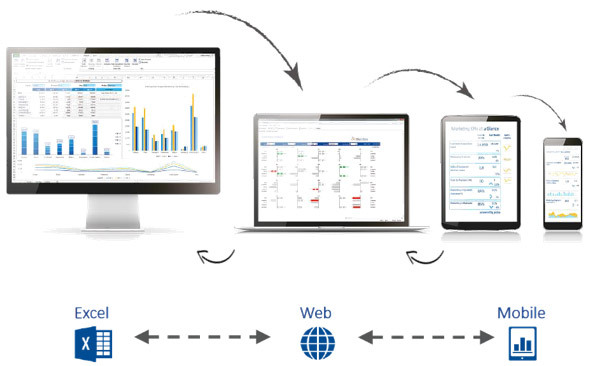 Jedox features an interface that is easy to use, easy to understand and easy for users to operate whether consulting, collecting or sharing reports, dashboards and data collection forms, just as it is easy for modeling and creating new reports. The interface enables users to obtain results that are aesthetically pleasing and attractive with dynamic interactive components of a quality high above the best state-of-the-art interfaces currently available on the market. CONNECT JEDOX TO YOUR INFORMATION SYSTEM TODAY AND IMPROVE YOUR PERFORMANCE!